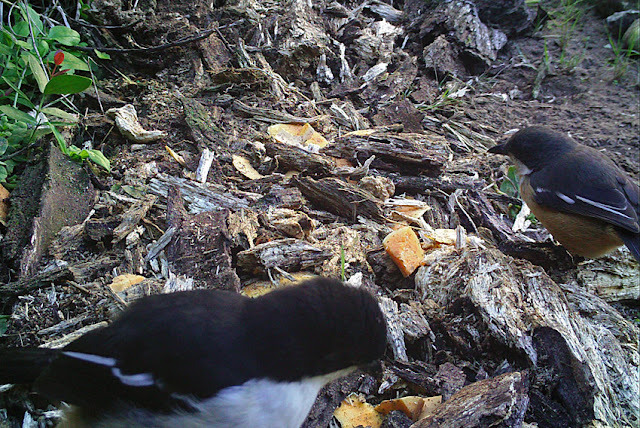 I use this blog to share some results from placing camera traps in interesting areas throughout South Africa to discover what wildlife still lives there. If you would like to be automatically notified when new posts are added feel free to use the links at the end of the menu on the right to subscribe to this blog. When I visit Cannon Rocks I like to bring one or two camera traps with me. While the SecaCam was busy at the birdbath (see older post over here), the Bushnell NatureView HD was used for a day or two at three different locations. We are fortunate to have some lovely Aloes growing next to our house. 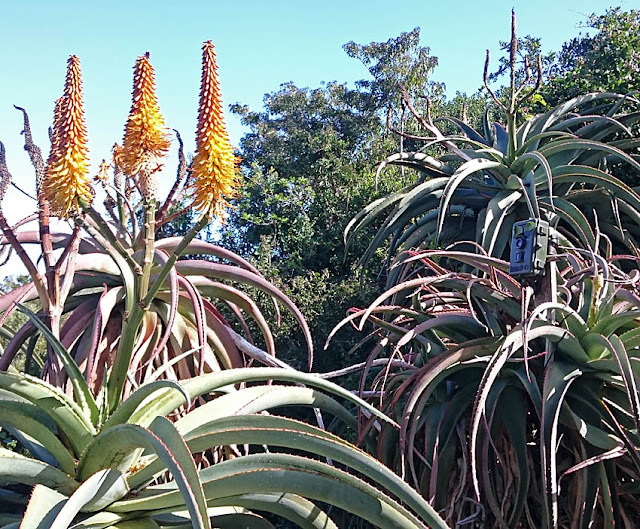 I don't understand how its possible but these Aloes are almost always in bloom throughout the year. If there is ever a time without blooming flowers then you will be sure to find at least one plant with new flowers already on the way. As a result these plants are a magnet for nectar feeding birds. 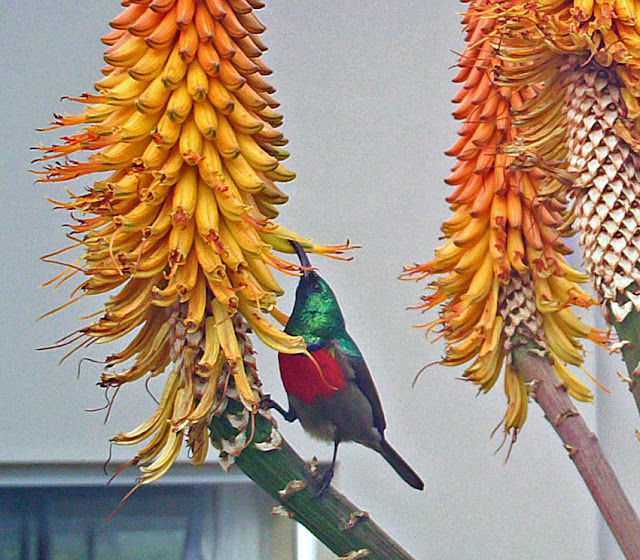 I've personally seen five species of Sunbird visiting these plants, not to mention all the other birds with a sweet tooth. I had some Butternut pumpkin one evening for dinner and thought it might be interesting to see what animals might be interested in the scraps. I must admit I was quite surprised with the results. The Southern Boubou was on the case immediately, and would come back time and again until there was nothing left. Interestingly it was the female that was the most frequent and persistent visitor. 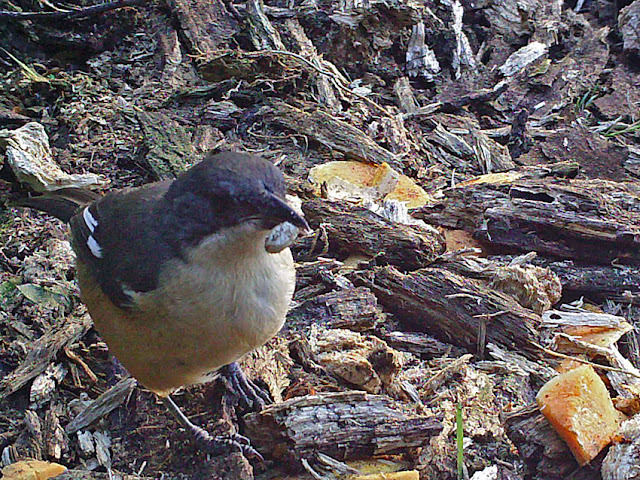 The female was after the pumpkin seeds and didn't show any interest in the pumpkin peel or flesh. According to the internet pumpkin seeds are very nutritious. 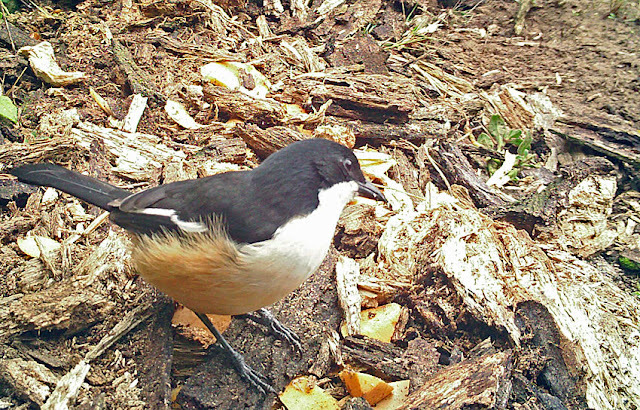 What makes this interesting to me is the fact that these birds eat predominantly insect, snails, worms, etc. and small animals such as lizards and even baby mice. But they do also have some omnivorous tendencies, enjoying a drink of nectar and are keen to dig into some fruit, and apparently now we also know that the females enjoy pumpkin seeds. I'm assuming that the seeds help to get the female in good shape for breeding (egg laying in particular)? However, this time around I decided to take a risk and set out the camera trap for two night, in the middle of the week. Because I only wanted to leave the camera trap there for a short time I decided to empty a can of tuna in front of the camera as some bait. 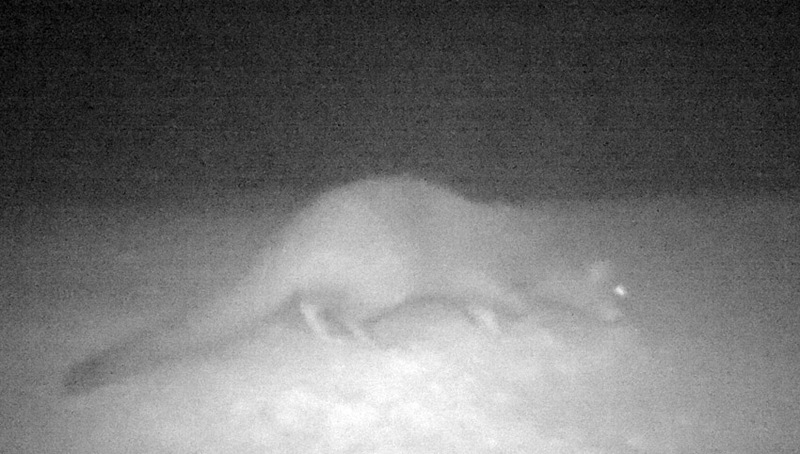 The Marsh Mongoose showed up on the first night. 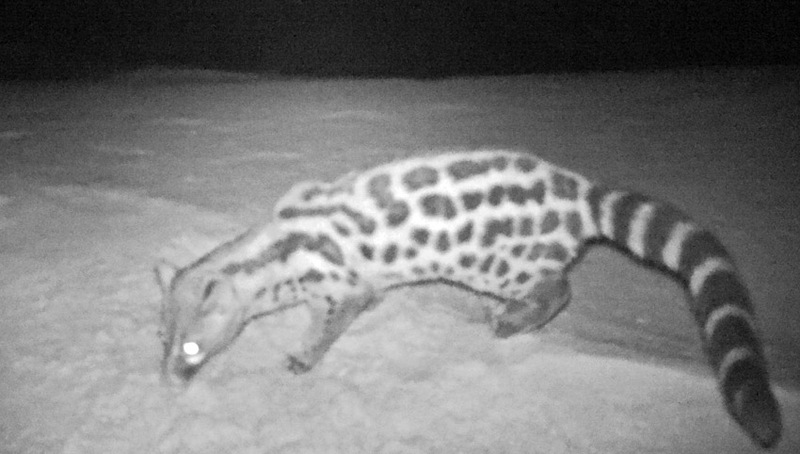 On the second night a Large-Spotted Genet made sure to cleanup any bits of tuna the mongoose might have missed. I often find tracks of these two nightly beach visitors along the vegetation edge, but its good to finally see them "in person" doing their rounds up and down the beach. Click here and subscribe to recieve the latest posts via Email. Note: This work should be attributed to Henry de Lange and should preferably also include a link to my blog (this site). Henry de Lange (Creative Commons BY-NC-ND 3.0). Awesome Inc. theme. Powered by Blogger.